Marco del Rossi is a Dragon Lord in training who must save Rapunzel de Bar from her dark curse or she will be trapped in the tower forever. Hanging by her long braid and swinging from the tower, Rapunzel de Bar hurriedly lowered herself to the ground. She barely dared to breathe, hoping Hecuba wouldn’t notice she tried to escape. Lightning slashed across the sky, lighting up the tall, stone tower in an eerie bluish glow. Thunder rumbled in the distance, sounding like the low growl of an angry giant. It would be only minutes before the sky split open and rain came pelting down. She had to hurry! “I knew this wretched curse had to be good for something,” she said aloud to herself, never having anyone but the witch to talk to since she’d been imprisoned in the tower. “I’ll show the old hag no one can keep me locked up and treated this way.” Rapunzel had cleverly tied the end of her very long braid around the bedpost in the tower. Then she used her hair as a rope. Climbing out the window, she propelled downward, making her way to the rocky earth below. With no doors and only one window in the tower, she had no other means of escape. This had to work. Waiting for her brothers to save her had become tiresome. They were taking much too long. Besides, it wasn’t as if a knight in shining armor were going to ride up and rescue her. Nay, she decided if no one were coming to her rescue, she would just save herself. The witch had, thankfully, left her alone for the time being. Rapunzel could only hope in the light of the moon she’d be able to find her way in the night back to Castle Fane in Slapton. That’s where she’d last seen her brothers Hugh, Arnon, and Stefan. Or possibly, she could make her way to the last place the old the witch had her hidden at Breckenridge Castle before bringing her here. She’d seen her brothers, MacKay and Stefan, arrive at the gate of Breckenridge in a failed attempt at rescue. She’d called out to them but was whisked away by Hecuba before her brothers could make their way to her. “I’m almost there,” she said aloud, looking to the ground that was still a good body’s length or more away from her. 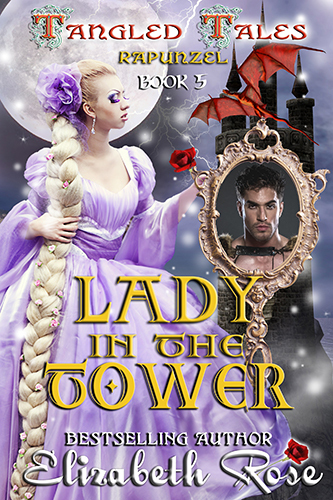 Her hair was long, but not quite long enough to reach down the entire length of the tower. With one arm wrapped around her blond braid to support her weight, she reached into her boot with her free hand and grabbed the pair of shears she had hidden there. Her only hope was that wherever Hecuba was right now, she wasn’t gazing into that mirror of hers. If so, Rapunzel’s escape would no longer be secret. No one could hide from the witch’s magic mirror. “It’s not going to hurt,” she told herself, eyeing up the hard, jagged earth below, trying to convince herself it was true. Rapunzel decided to stay positive in this dire situation. Opening the shears and placing the sharp edges against her hair, she prepared to cut herself free. The beating of her heart echoed in her ears even louder than the distant thunder. As she prepared to snip her locks, she heard the sound of hoofbeats pounding the earth, coming right toward her. Dangling like a limp rag doll in the air, she curiously watched the scene unfold. Unfortunately, her luck became worse when the sky opened up and released a torrential downpour. It was the last thing she needed. One rider on horseback sped past beneath her, and another followed right behind him. Closing her eyes, she squeezed the shears against her braid, severing the hair in two. Down she fell, crashing into the second rider, managing to land atop the horse instead of the ground. Her fall had been broken! Rapunzel’s eyes sprang open. Her arms flayed wildly, grabbing for the man that sat in front of her on the horse as she tried to regain her balance. The force of knocking into the man sent both of them tumbling to the cold, wet ground. Rapunzel gasped as the horse reared up and pawed the air. The animal cast a shadow from the moonlight, threatening to come crashing down on her. It would have landed right on her if the man hadn’t rolled over the ground and pulled her out of the way with him. The horse’s hooves crashed down right next to her head. With eyes opened wide in terror, Rapunzel held her breath. “Bid the devil,” the stranger ground out. With both of them tangled in his long, black cloak, she found it nearly impossible to move. Rain continued to fall like a barrage of arrows, soaking them to the skin. The next crack of thunder was so close that it spooked the horse. The horse whinnied, and turned and ran away in the dark. “Nay! Come back here, you stubborn nag,” screamed the man, ripping his cloak out from under her and jumping to his feet. He took two strides, starting to go after the mare but stopped in his tracks when he realized it was no good. He’d never catch the animal in the storm. “You!” he spat, pointing an accusing finger at her next as he stomped toward her. His booted feet splashed in the puddles of water that were quickly accumulating on the ground. One strong hand clasped around her arm as he dragged her to her feet. Dark eyes the color of weathered blackthorn drilled into her. “You’re a girl!” he spat as if the idea not only surprised but also disgusted him. “Good of you to notice.” She pushed back her shoulder-length hair. It felt freeing to be rid of all that weight. But even with her hair mostly gone now, that wouldn’t last long. Every time she cut it off, it grew back longer and even stronger than before. This was the curse she’d been saddled with, thanks to the evil witch, Hecuba. The witch tortured Rapunzel’s father, warlock Lucio de Bar, by using his children to get to him.